St. Margaret’s Hospital Guild is pleased to present the residence at 4160 Washington Boulevard as its 2019 Decorators’ Show House and Gardens. This is the second time in the event’s 58-year history that the home has been featured. The property was the location of the Guild’s 19th annual fundraising effort in the spring of 1980. The brick and timbered Tudor Revival home at 4160 Washington Boulevard was built in 1919 by Clark E. Mallery and Roberta Spellman Mallery. Mr. Mallery was one of the founders of the American Garment Company, a manufacturer of women’s clothing. Mrs. Mallery was the aunt of Mrs. Robert H. Tyndall, wife of the 34th Mayor of Indianapolis. The architectural firm hired to design the home and supervise its construction was Rubush & Hunter. Established in 1905 and active until 1939, when its two principals decided to retire to Florida, the company designed more than 250 structures during its 34 years of existence. Among the many commercial buildings attributed to Preston C. Rubush (1867-1947) and Edgar O. Hunter (1873-1949) are the former Indianapolis City Hall, several buildings on the campus of the Indiana School for the Deaf, Buckingham Apartments, Circle Theatre, Columbia Club, Illinois Building, Guaranty Building, Indiana Theatre, Indiana State Fairgrounds Coliseum, Madam C. J. Walker Building, and Circle Tower Building. Residences designed by Rubush & Hunter can be found in several Indianapolis neighborhoods, including the Old Northside, Herron-Morton Place, Meridian Park, Meridian-Kessler, Irvington, Butler-Tarkington, and Woodruff Place. The subject home contains 9,163 square feet, of which 8,438 square feet are in the two-and-half levels above ground. The remaining square footage is in the basement. The northern portion of the house was built on an angle to the southern portion of the house, creating an unusual appearance. The explanation for the home’s unique floor plan, handed down anecdotally over the years, is that there was a tree on the north side of the unimproved lot that the Mallerys did not want to cut down in order to build the house. The architects angled that wing towards the northwest, which allowed the tree to remain. The main level of the home contains a center entrance hall that extends from the front of the home on the east side to the back of the home on the west side. The portion of the center hall inside the front entry door has a vaulted ceiling that rises all the way to the third floor. The staircases and beamed ceilings in the front entry hall are solid oak. The portion of the center hall towards the back of the house contains a half-bath and a coat closet. Outside the rear exterior entrance to the hall is a brick driveway and a porte cochère. To the south of the front entrance hall is a 32-foot-long living room with a beamed ceiling and a fireplace. Off the living room to the west are a library and an enclosed sunporch. To the north of the front entrance hall is a 20-foot-long dining room with paneled walls and a beamed ceiling. Adjacent to the dining room and to the west of it is the kitchen, which also connects to the rear portion of the center entrance hall, as well as to a back stairway to the second floor and a door to the attached garage. The original three-car garage has been modified to be a two-car garage, with storage in what was formerly the third bay. An additional two-car garage was built in the 1960s, adjacent to the original garage. On the second floor, the vaulted-ceiling center entrance hall provides a buffer between the master bedroom suite and the other bedrooms. Located directly above the living room, library, and sunporch, the master suite contains a bedroom with a fireplace, a dressing room, several closets, and a full bath. To the northwest side of the second-floor center hall are five bedrooms and three full baths, which are above the dining room, kitchen, and the attached garage. The third floor was originally equipped with a ballroom, which was a common feature in the late 1800s and early 1900s in the homes of families who did a lot of entertaining. In more recent decades, the ballroom has served as a family room and recreation area. There are also rooms off the erstwhile ballroom that could serve as bedrooms or craft and hobby rooms. In filing for the building permit in April of 1919, Rubush & Hunter estimated that construction of the home would cost about $20,000. That figure did not include the cost of the land, as the Mallerys had purchased the lots prior to building on the property. In 1922, after living in the home they had built for only two years, the Mallerys sold the property to Abram Lazarus Block, a merchant who was also active in numerous community affairs and charitable organizations. Mr. Block was the owner and president of L. Strauss & Co., an upscale men’s clothing store. In addition, he was the founder of the Circle Theatre, part owner of the Indiana Theatre, and chairman of the board of the company that built the Circle Tower Building. Abram Block and his wife, Rachel Fischel Block, purchased the residence for their only child, Miriam Block Lyon, her husband, Jerome Lyon, and the couple’s 7-year-old daughter, Alma Block Lyon. Alma was the only child to live in the home during the first fifty-nine years of its existence. In 1928, Woodbury Treat Morris and Mary Florence Malott Morris became the third owners. Woodbury was the Indiana representative of the Domhoff and Joyce Company of Cincinnati, Ohio. Mrs. Morris was the daughter of Volney Thomas Malott (1838-1921), president of Indiana National Bank. During the time that Mr. and Mrs. Morris owned the home, an interesting coincidental event occurred. In 1936, the home's previous owner, Abram Block, passed away. In his will, Block bequeathed ten large oil paintings by well-known Hoosier artists Clifton Wheeler and Otto Stark to St. Margaret’s Hospital Guild. The paintings, which were depictions of Mother Goose rhymes, had formerly hung in Mr. Block’s store, L. Strauss & Co., at the southeast corner of Washington and Illinois Streets. In a ceremony the following year, St. Margaret’s Hospital Guild donated the artwork to City Hospital, which is the name by which today’s Eskenazi Health was known at that time. The paintings were subsequently mounted on the walls of the hospital’s children’s ward. No one could have imagined in 1936 that the home once owned by Mr. Block would also help St. Margaret’s Hospital Guild support the hospital’s work in 1980 and again in 2019. In 1958, Samuel Patrick Solomon and Opal Stillwell Solomon became the fourth owners of 4160 Washington Boulevard. Mr. Solomon owned the Wilson Furniture Company for 40 years. His wife continued to operate the company for a number of years after his death. In the summer of 1978, Thomas Francis Skehan and Ann Theresa Reynolds Skehan purchased the home from Mrs. Solomon. Mr. Skehan was a manager at Union Carbide Co. The Skehans had visited the Decorators’ Show House and Gardens earlier that year, which was across the street at 4145 Washington Boulevard. The family loved the neighborhood, as well as the ample space provided by the homes on Washington Boulevard. They had lived in the suburbs when they first came to town and were spending considerable time driving their seven children to activities in the city, so it was an easy decision for them to make when 4160 Washington Boulevard came on the market. The Skehans’ children were the first children to live in the home since Alma Block had left in 1928. In 1983, Max and Barbara Danner became the sixth owners of 4160 Washington Boulevard. Mr. Danner was the chairman of the board and CEO of Danners, Inc. He died in 1985. Barbara -- who has lovingly maintained the house longer than any of the other five homeowners -- along with her children, grandchildren, and great-grandchildren, continue to enjoy the house today. In 2008, the area in which the home is located, Washington Park, was placed on the National Register of Historic Places. The district includes the properties from the north side of East 40th Street to the south side of East 43rd Street and from the west side of North Pennsylvania Street to the west side of Central Avenue. St. Margaret’s Hospital Guild is grateful that Mrs. Danner and her family have agreed to open this wonderful home to the public for the 58th Decorators’ Show House and Gardens. 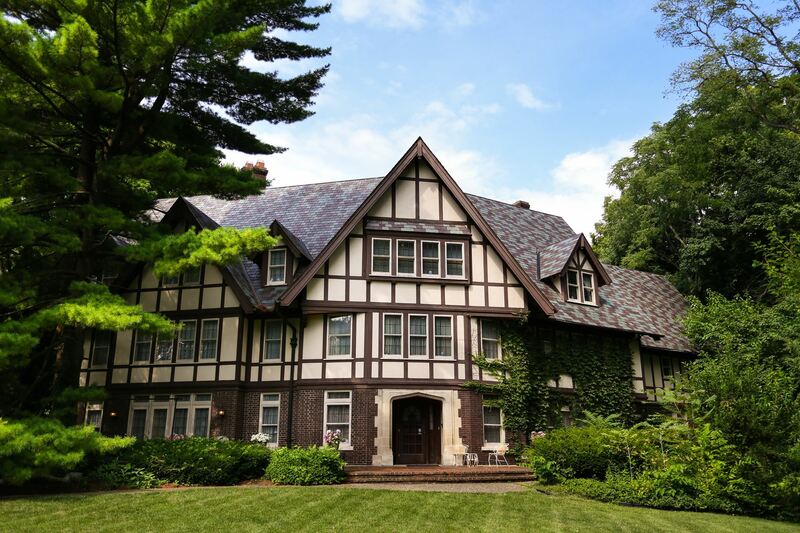 The Centennial Estate will be 100 years old in 2019, so it is a perfect time to celebrate the home’s beautiful architecture and grounds, while at the same time raising funds for a worthy cause.